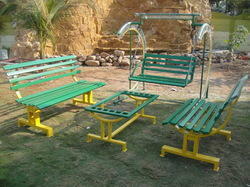 We are manufacturer of high quality Garden Furniture. 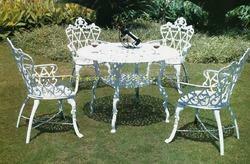 We are one of the leading supplier of cast iron garden furniture in India. Garden Rattan Set , MS frame powder coated & weaving of PVC rattan . We offer a wide range of garden furniture. We manufacture a large range of Bronze Garden Furniture, made using best quality Bronze alloy. The range of Bronze Garden Furniture provided by us includes benches, tables etc. These have intricate designs and attractive carvings, which make these look appealing to the users. Backed by our skilled professionals, we offer a wide range of Garden Furniture Set. These are manufactured using high quality raw material with the help of latest techniques. These garden furniture are offered t highly reasonable rates to our clients and are having excellent features.